Okutama is the far west side of Tokyo where has lots of nature. 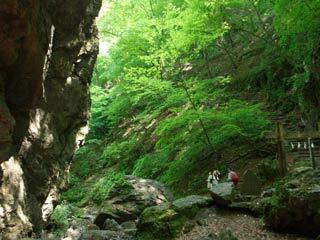 There are many hiking courses, and most of them are one-day-trip distance from Tokyo Metro without car. Okutama is considered as the Oasis of Tokyo. Lake Okutama is one of popular spot in Okutama. It has many tourist attractions. In winter, unlike Tokyo cities, Okutama has snow and frozen waterfalls. Use Chuo Express Way west to Kenodo North. Exit at Hinode. Use JR Chuo Line to Tachikawa Station. Chane to JR Ome Line to Okutama.